Microsoft App-V: Dynamic Configurations or RES Workspace Manager? When you’re using Microsoft App-V 5 to distribute your “virtual” applications it can be cumbersome to apply settings afterwards. With native installed applications you have to ability to update files, registry settings or apply permissions (since App-V 5 always applies default permissions). Within a virtual application these settings needs to be applied within the virtual environment (often referred to as “the bubble”). Up to App-V 4.x you had the ability to add custom actions in the OSD file, starting App-V 5 this is replaced with Dynamic Configurations. While Dynamic Configurations are more powerful and flexible then the static OSD files I couldn’t resist to show you how RES Workspace Manager can simplify this. Let’s start with diving a bit deeper in the Dynamic Configurations. Basically what’s changed from App-V 4 to App-V 5 is that the information that previously was stored in the OSD file (shortcuts / FTA’s and optionally scripts) are now stored in the main package with an .appv extension. 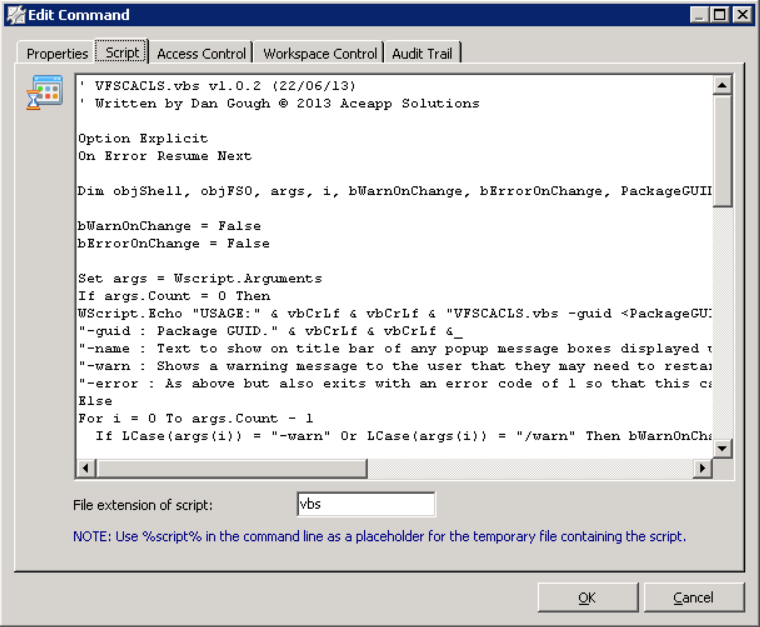 Inside the .appv package a manifest xml file resides containing information that was previously in the OSD file. 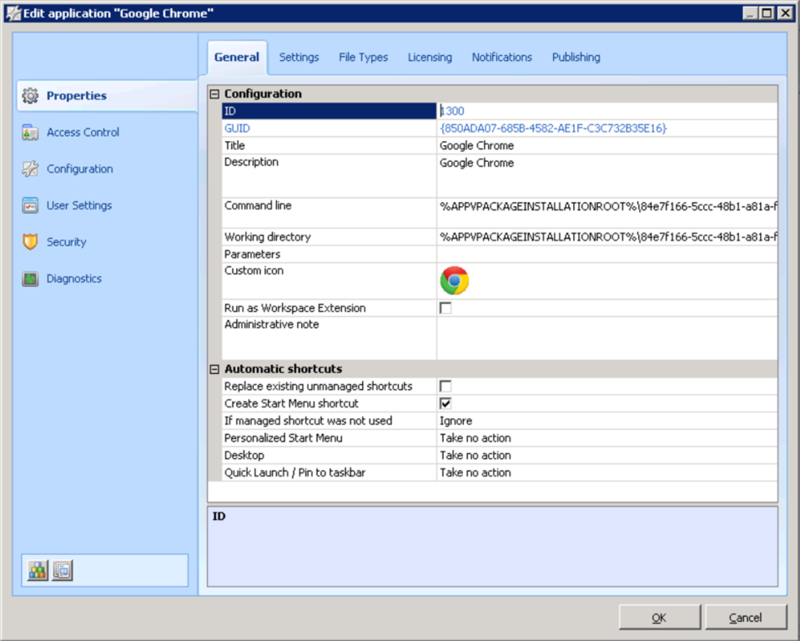 Dynamic Configuration files are XML files can be applied to all environments (the Default Configuration) or a certain group of users / computers (a user configuration). Dynamic Configuration files are created automatically when an package is created with the App-V Sequencer: <packagename>_UserConfig.xml and <packagename>_DeploymentConfig.xml. For more information about Dynamic Configurations please read Deployment Models and Dynamic Configurations in App-V 5 by Falko Gräfe. As mentioned earlier the Dynamic Configuration files are XML files that you can edit. Microsoft published an article on TechNet describing the file structure and description (link) which should help you editing the files. It’s limited but it’s no rocket science. To avoid syntax errors in the XML file an XML editor can be used. Microsoft published XML Notepad 2007 which is an free and easy to use tool for editing XML files. As a bonus it comes with XML Diff ( View > Compare XML Files) to compare XML files. Editing the Dynamic Configuration files can be tricky. 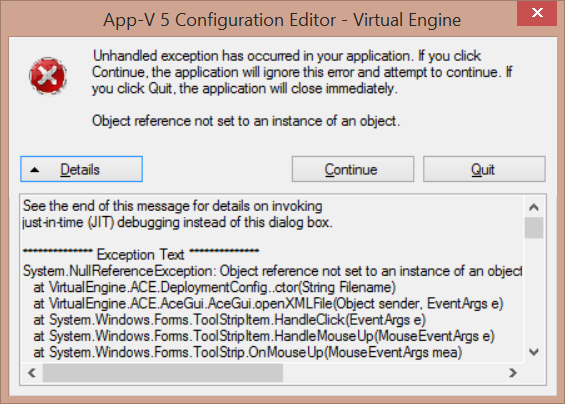 To avoid syntax errors and to ease your life the guys of Virtual Engine created the awesome App-V 5 Configuration Editor (ACE). Note: The path to the .appv file can be via HTTP or SMB, the DeploymentConfg.xml file only via SMB. Note: The path to the .appv file can be via HTTP or SMB, the UserConfg.xml file only via SMB. When you’re using a full App-V infrastructure (using a Management and Publishing server) you can use the webconsole to export or import the Dynamic Configuration. Using the full App-V infrastructure it very easy to apply different user settings to different users or groups. If you don’t have the original XML file of the Deployment / User configuration this can be exported from the App-V management database. Once you know how it’s done it’s very easy. 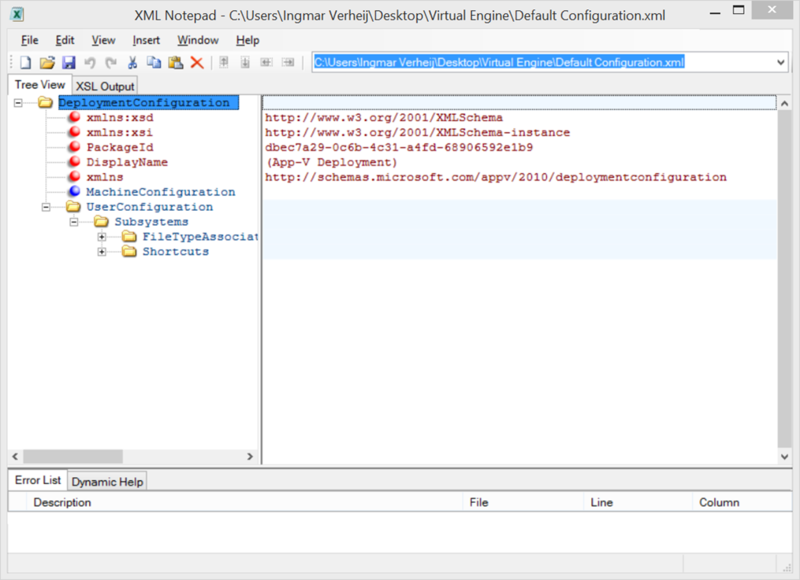 If you open the exported Dynamic Configuration file in Virtual Engine ACE v.1.1.5906 (or earlier) an exception is raised . If you open the exported Dynamic Configuration file in Virtual Engine ACE v.1.1.5906 (or earlier) an exception is raised . The guys at Virtual Engine are working on a new release (I will update this article when this is available). For the time being the problem can be mitigated by changing two lines in the XML file. Changes are in Bold. You’ll still see an exception, just click on Continue and the application will work as expected. 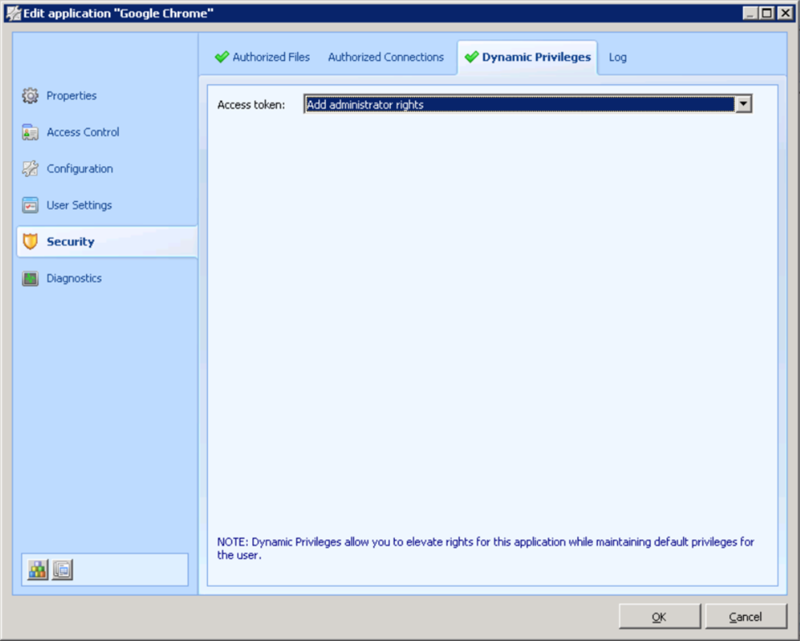 The procedure to import the Dynamic Configuration is similar like exporting. The initial steps are equal except for the last step where you click on Import an Overwrite this Configuration. If you open the import the Dynamic Configuration created with Virtual Engine ACE v.1.1.5906 (or earlier) the same error is shown. This is because the App-V Management server considers comments and an invalid syntax . The guys at Virtual Engine are working on a new release (I will update this article when this is available). For the time being the problem can be mitigated by removing the comment in the XML file. Applying Dynamic Configuration to App-V packages require quite a lot of effort, especially when you need to troubleshoot (as the logging in App-V is extensive but ridiculously complex). It’s important that you document properly so you can maintain the application during it’s lifecycle. Enter RES Workspace Manager (WM). With RES WM you can manage the users environment including it’s application. 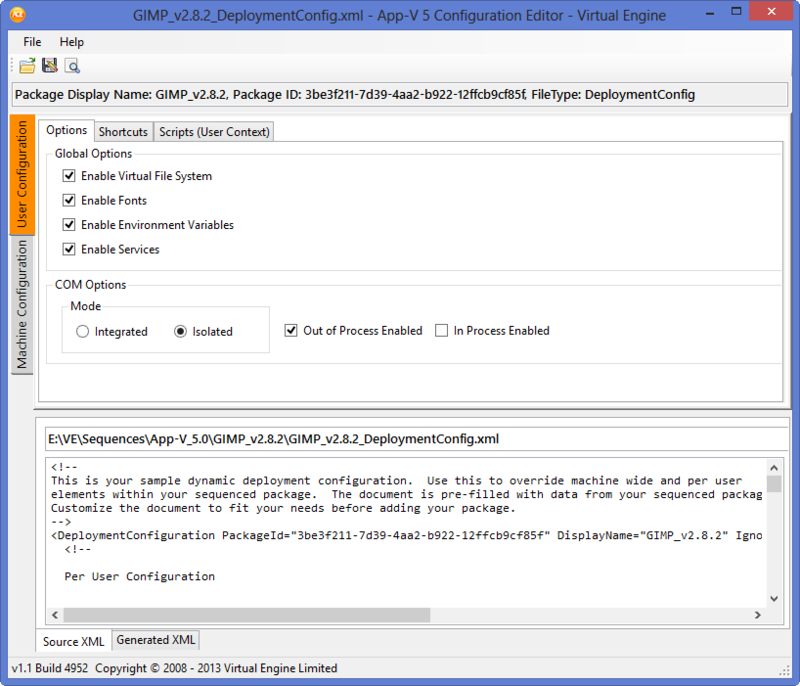 In all editions the Application Virtualization Integration feature is available (part of the composition and personalization module) is available which allows you to apply custom actions within the virtual environment (“the bubble”). Dynamic Privileges. Add (or remove) administrative privileges per application. Application Virtualization helps you with application interoperability not application compatibility. Let’s assume you need to change the ACL on folders of an App-V package. Dan Gough wrote an detailed article explaining the differences between App-V 4 and 5 including a VBscript which grants the owner of the users local appdata folder write access (Full Control). Instead of using a Dynamic Configuration to run the VBscript I use an Action to run the script in RES Workspace Manager. Alternatively you could have chosen to inject a token in the process to grant Administrative privileges to this user. Note: App-V 5 integration is available since RES WM 2012 SR3. Thanks for mentioning ACE in the article and another great blog. I would certainly advocate using RES Workspace Manager to make things a whole lot easier!!. The example above uses the DeploymentConfig.XML and will publish the application to all users ( -Global ). The important part is to remember to Publish the application again, otherwise your changes won’t be applied. You’re right! I added a note in the considerations. Sorry for posting to an old post, RES recently improved their AppV 5 integration, but left out support for Dynamic Config files – I raised a support ticket and was told to create a User Voice for adding support if the community wanted the feature. I’ve also requested support for HTTPS streaming which is missing from the RES integration. Here are the links to the RES User Voice requests, they will only get implemented if RES see’s enough votes from the community. I am trying to apply a custom deployment config file using app-v management console however I keep getting the following error “the configuration file did not contain well formed app v configuration xml.” as mentioned in ur writeup. However the same config file works perfect when i use powershell installation using -dy command. There is nothing in the server eventlog either. I went through your article but could not point out the fault yet.